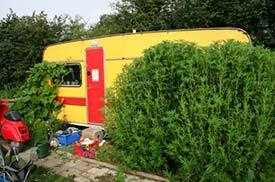 ABOVE: A cannabis-enhanced campsite near Amsterdam. This year-round campground with cabins is in Amsterdam, and you can reach it by bus or tram. Amenities include a supermarket, restaurant, bar with terrace, animal farm, and bicycle rentals. A swimming pool is nearby. No pets are allowed here, but if you're traveling without animals between April and the end of September, this campground's handy location may be tempting. A Metro station is only a 5-minute walk from this facility. which has 410 campsites within a nature park overlooking a lake where motorboats aren't allowed. In addition to campsites, Amsterhamse Bos has a budget hostel with rooms that hold two to eight beds each. Camping or hostel rates include use of the communal kitchen and dining room. Reaching Eurocamping De Badhoeve from Centraal Station requires two bus rides plus a 10-minute walk, but it's easy to find by car from the A10 ring road. The campground and boat basin are located on the Markermeer, a lake (reclaimed from the sea) about 15 km or 10 miles from Amsterdam. Accommodations include tent pitches, caravan/camper hook-ups, "hiker cabins," trailers, and chalets with private bath. A supermarket, restaurant, and bar are on the premises.